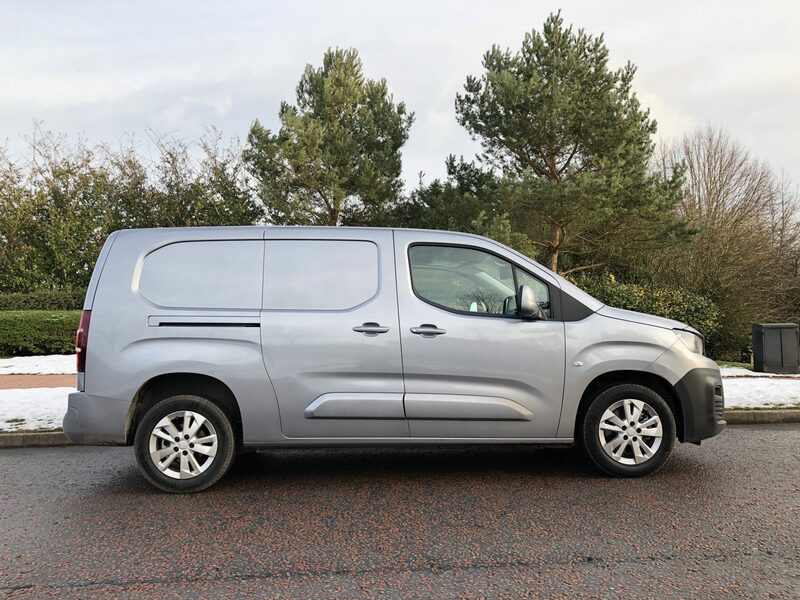 Like buses, good things often come at once, such as the last Peugeot Partner van alongside sister models Citroen Berlingo van & Vauxhall Combo Cargo. Three vans, all similar & all as it happens, developed by Peugeot, who were the leaders in the development of the new vans. Peugeot have used a combination of the previous Partner’s tech with the latest EMP2 platform borrowed from the current Peugeot car range, which has resulted in a range that features the most up-to-date tech of any current small van. Like the Citroen & the Vauxhall, there are two lengths of Peugeot Partner, which are Standard & Long. A single roof height is offered, with cargo volumes ranging from 3.3 to 3.8 cubic metres. Payloads range from 667kg to 1,050kg. The Partner uses Blue HDi diesel engines found in the previous model, producing 75hp and 100hp, while a newer BlueHDi 130 sits at the top of the range. There’s also a PureTech 110 petrol coming in 2019, which could be an option for those using the Partner in town or over shorter distances. All versions come with manual gearboxes, while the more powerful engines are available with an optional EAT8 automatic gearbox, with a higher-output PureTech set to become available in 2019 with this gearbox too. There are four trim levels available on Partner; the Partner S, Partner Grip, which is geared towards the construction industry, plus Professional & Asphalt, which offer buyers a more car like experience & higher levels of equipment. All Partner models get offset double rear doors, a full steel bulkhead, a single sliding side door, with twin doors on the Long version that we tested. There’s also a reach & rake adjustable steering wheel, auto lights, remote central locking, six hooks in the load area floor, plus Bluetooth. All models bar the entry level S, feature the Multi-Flex seat system, which adds a through-loading bulkhead & an extra half a cubic metre of load space where the front passenger seats are located. 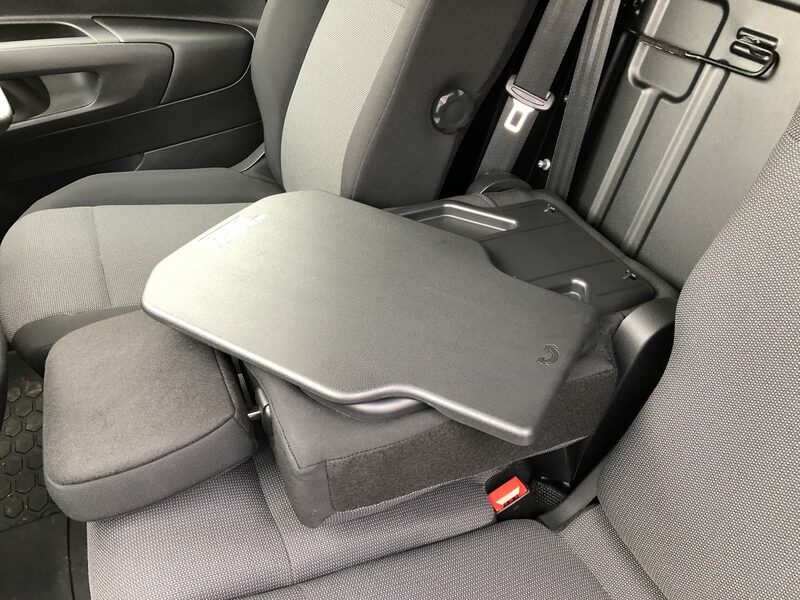 In common with many small vans today, the front seat folds down so that longer items can be loaded & the middle front seat lifts up to offer storage space, or can be folded down to create a useful swivelling desk top. The Partner Grip adds Peugeot’s Grip Control system, which features switchable traction control for different surfaces, plus a 30mm raised ride height, with Mud & Snow tyres for extra traction. Partner S is solely a two seater, whilst Grip, Professional & Asphalt models all get three seats. 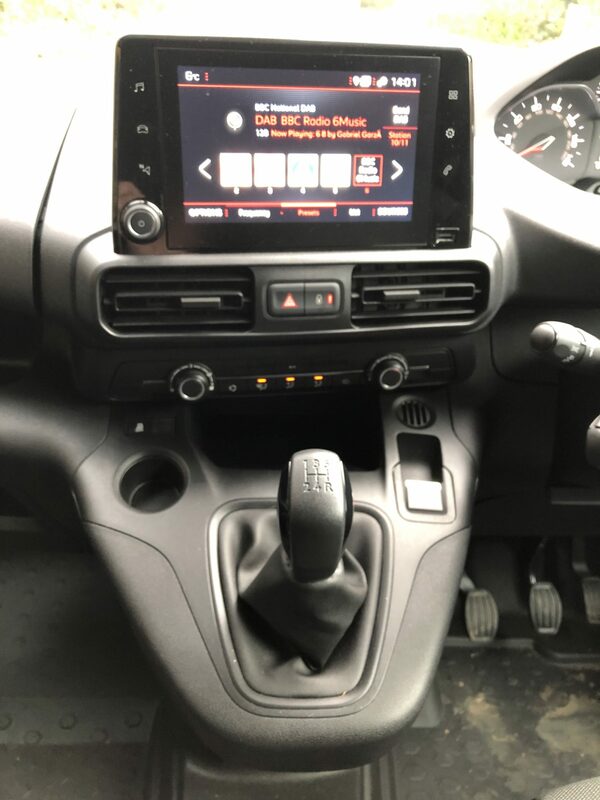 Professional vans come with rear parking sensors, cruise control, a touchscreen DAB radio with Apple CarPlay & Android Auto, plus two USB sockets. Asphalt vans add body coloured bumpers, alloy wheels, SatNav & rear and nearside cameras. All of these extras can be added to lower spec models from the extensive options list. 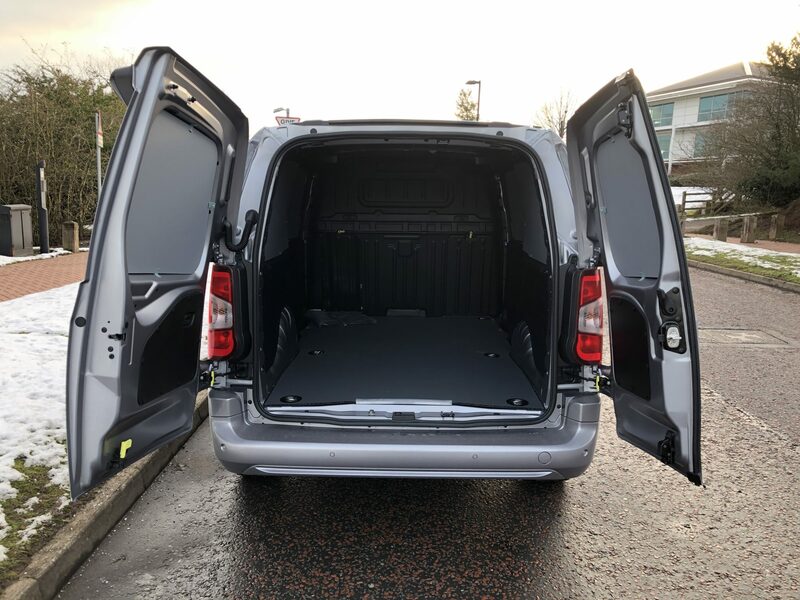 The stiffest competition comes from the Ford Transit Connect & Volkswagen Caddy, with the Renault Kangoo, Mercedes-Benz Citan & Fiat Professional Doblo Cargo, now lagging behind the Partner, especially with on-board safety & tech. Climb aboard & you’ll find that the cabin is a comfortable place to be, with decent seat adjustment on offer. 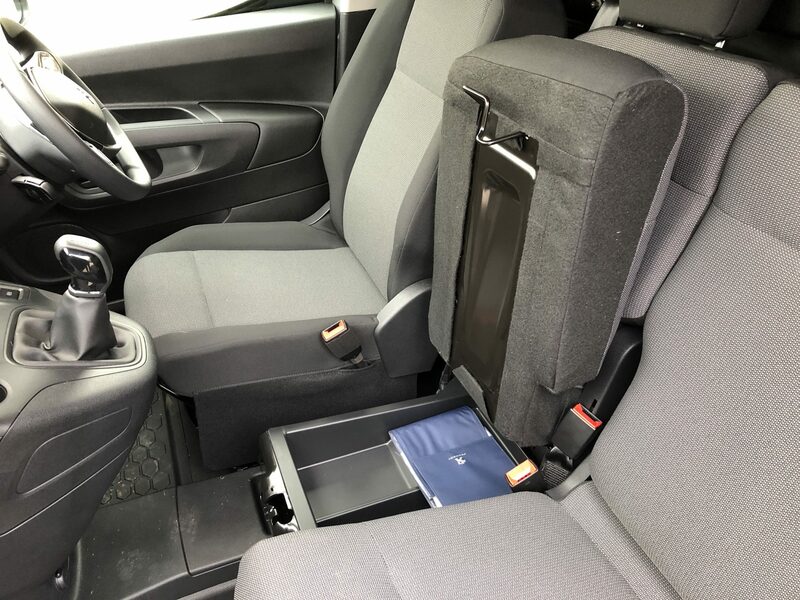 For those who love cubby holes & spaces to put their water bottles, keys or paperwork, the Partner offers eight dashboard storage spaces, two with lids, plus a full cabin width overhead storage space above the driver & front passenger’s heads. There’s even two decent sized door pockets, plus the hidden storage underneath the centre seat. A reach & rake adjustable steering wheel, makes it easy to get the right driving position as well. I’m pleased to say that like the larger Expert, the dashboard, fixtures & fittings in new Partner, are all of good quality, including the seat fabric, whilst also looking & feeling built to last. Vans are now more car-like than ever & our test model the Partner Professional Long really shows this up, with dual AirCon, a centrally located dashboard mounted 8″ touchscreen, which offers DAB radio, MirrorScreen, Bluetooth, a USB socket & aux in, rear parking sensors & a rear view camera where the rear view mirror is located. This can be used to aid reversing & I found it extremely useful. I spent a week in the Partner, a week in which we had the first significant snow of the year & it didn’t skip a beat. On a mix of motorway & urban roads, the Partner handled brilliantly & I almost forgot that I was driving a van, albeit unladen. The inclusion of Apple CarPlay allowed me to usurp Peugeots own on board SatNav, an extra on my test model, to use Google Maps, as well as to charge my iPhone & listen to those all important podcasts as I drove around the north west. Steering on the Partner is light, making parking in town a cinch & the five-speend manual gear box & clutch are very easy to engage. On the motorway, the Partner is a comfortable cruiser. It’s quiet in the cab, the seats are comfortable, the full steel bulkhead keeps the heat in the cabin & the load space noise at bay & when utilising the Bluetooth hands-free phone & the DAB radio, outside wind & road noise are kept to a minimum. On smaller local roads, I found that the the Partner sits quietly in traffic, with the light clutch a real bonus in stop-start traffic. The Partner Long tackled some local country roads with aplomb & despite it’s length, it handled really well. I really liked the electric hand brake, the touchscreen & the steering wheel controls, which allowed me to choose from cruise control, infotainment or hands free phone calls without distracting me from the road. Are there any negatives ? The lack of a sixth gear is evident on the motorway, but isn’t really an issue & the centre front seat comes with limited legroom, thanks to the gear lever & gear system it sits behind. An adult will squeeze in here, at least one who doesn’t possess large rugby playing legs. I wouldn’t fancy a long journey in the middle from seat, but for shortish journey’s around your local area , it will suffice. Economy & emissions are worth noting. We tested the the Professional Long powered by the 1.6 Blue HDi 100 engine. This comes with 61.4mpg on the combined cycle with CO2 emissions of 119g/km. We tested the Partner unladen for a week, with just the driver. On the motorway, we achieved an average combined economy of 49.6mpg, whilst on the urban cycle this fell to 44.9mpg. We drove the Combo Cargo in November & the Citroen Berlingo panel van in January. 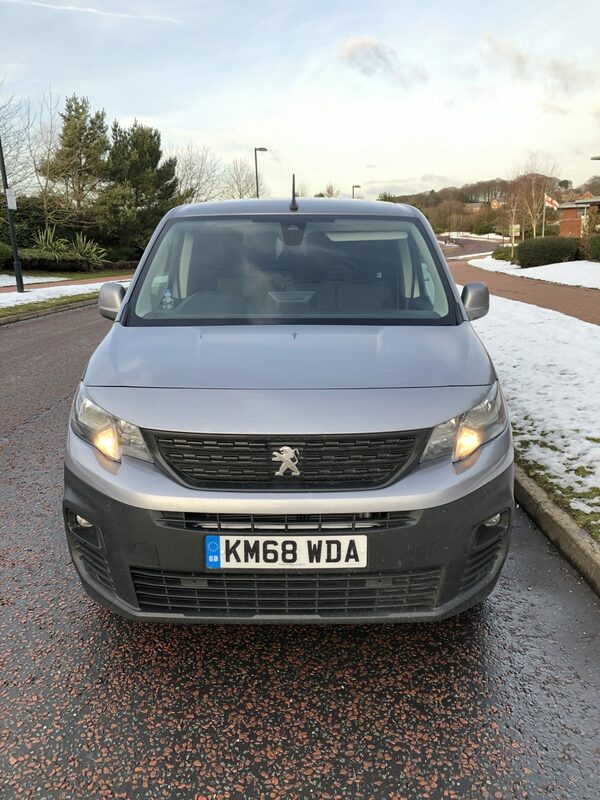 The Partner is to all intents & purposes the same van, although I have to say that the small Peugeot steering wheel in our test van, stolen from the Peugeot car range, makes the Partner a tad more enjoyable to drive than it’s siblings. What is important, is that the new Partner now sits right at the top of the sector & will give the Transit Connect & Caddy a few sleepless nights. PSA Groupe really are on a roll with their CV’s & this latest Partner only adds to the brands appeal.